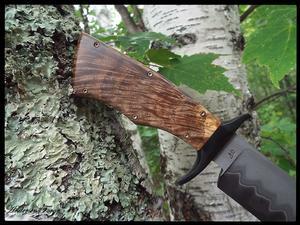 Just a fantastic knife, right here. I like just virtually everything about it. This was made with a lot of input from the collector. 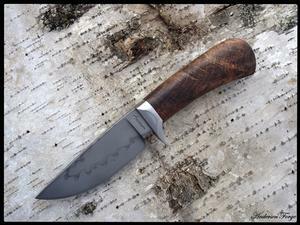 He chose the 1095 and 420 Stainless Steel Harpoon San Mai Blade and Damascus fittings, and I tossed in the spectacular piece of Stabilized Precentation Koa. I'm not going to elaborate on the knife too much. It just really speaks for itself. All done in a Take-Down assembly. A pure pleasure to build this one - I admit. 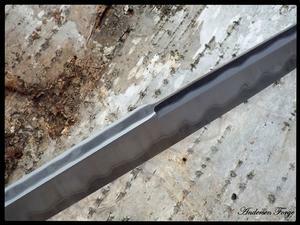 I forged the blade from a 1 1/8" round bar of W1 tool steel. 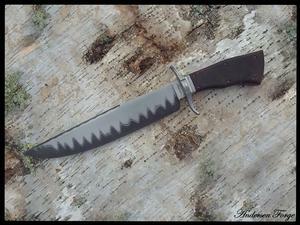 And, when hardening the blade I gave it the ol' clay processing treatment for the distinctive hamon. The guard, and rear assembly not shown here, are 416 stainless steel. 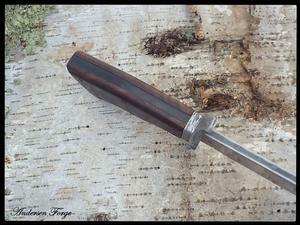 The combination of the guard and read finial allow for complete disassembly of the knife. 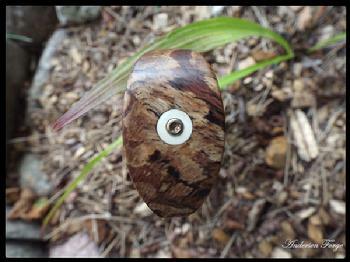 The outstanding handle material is stabilized Koa from Hawaii. This has become very popular over the last few years. I was able to acquire a nice selection of this material at this year's Blade Show in Atlanta. 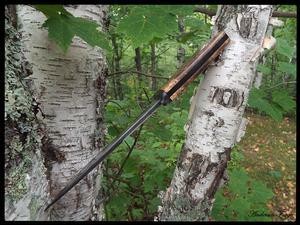 The contour offers a great grip. And when I sharpened this knife - it got SCARY!!!!!!!!! It is only occasionally I find a piece of oak like this one. And when I do - I grab it!! This is spalted oak burl. And it's very dark! When it gets like that, the coloring is fantastic. I got lucky to find this one. It is built in my signature take-down method. 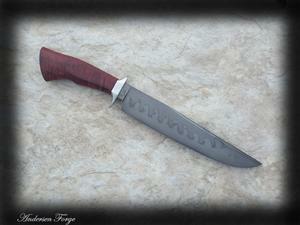 The blade has been heat treated to result in a very distinguishing hamon and is W1 tool steel. 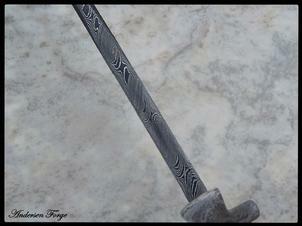 The guard is hand-rubbed 416 stainless steel. 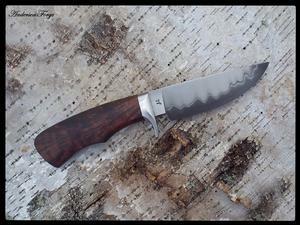 A belt knife that will accomplish many tasks. 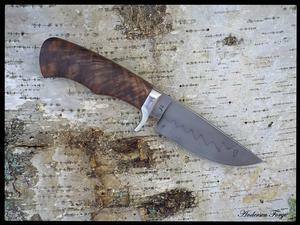 One of the most fun knives I've built. This one is a full frame handle built in a Take-Down assembly method allowing full access to the entire recipe of pieces. 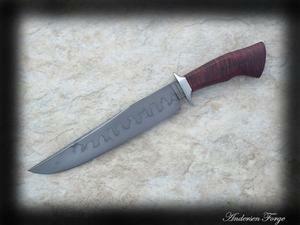 The blade is 10" of 1095 Tool Steel/420 Stainless Steel San Mai. 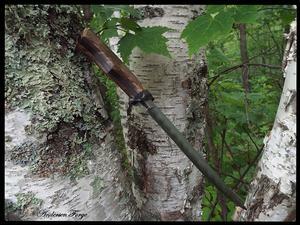 The "S" Guard is 1903 Wrought Iron. 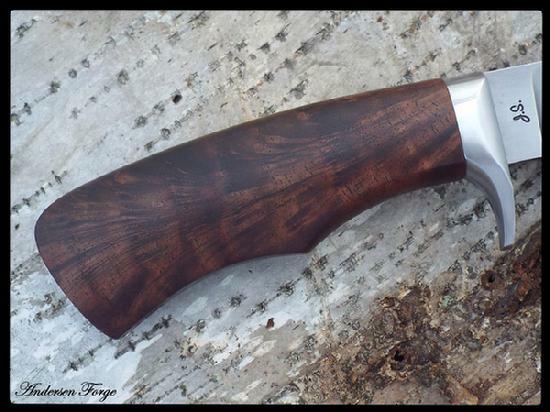 The fabulous handle material is spectacular flamed Walnut from Northern California. And, the mild steel frame has been hot-blued. A lot of thought and slow, steady and tedious work is needed to get averything locked in rock-solid, yet still be able to easily disassemble the knife for full access to all the components. Now living happily in Kansas. 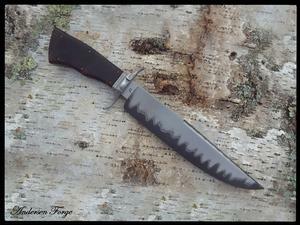 I forged this blade from a 1 1/8" round bar of Cru Forge-V, a high carbon forging steel made specifically for the forging knife maker. 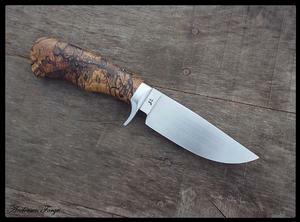 The handle is a spectacular example of stabilized end-grain, spalted Pecan from south Georgia. 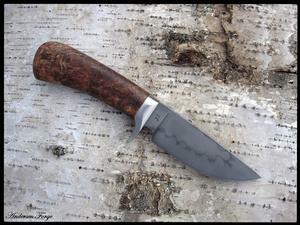 The knife was built in a full take-down assembly, and instead of leaving the finial exposed to the world, I covered it with a "cap" of mammoth Ivory decotated with a heat-colored 2-56 screw. I forged this San Mai blade fomr 3/8" thick 1095V and two pieces of 1/4" thick 420 Stainless Steel to reveal the striking display of San Mai with its distinctive carbon migration layering. 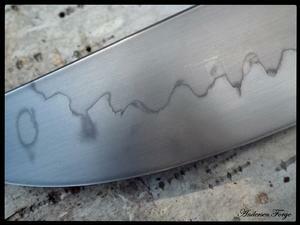 The undulations along the bottom edge of the Stainless Jacket are results from my drawing dies on my press. I was rewarded with a bit of a bonus after heat treating to see a unique display of hamon created by a combination of the 1095V, the stainless jacket acting like clay, and the correct heat and quench sequence. The scales - which are completely removable - are magnificent radial grained stabilized Walnut from northern California. 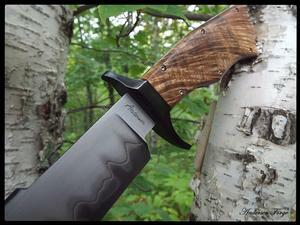 The guard and frame are hot-blued mild steel. This is built like a TANK!! yet completely disassembles for the Take-Down enthusiast. I do not know how a discriminating collector of unique knives could go wrong. 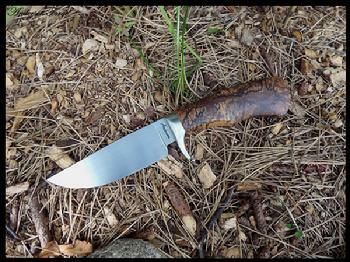 I swear, if there's a prettier handle material for a knife - I don't know about it. Stabilized, crotch Walnut is just spectacular. And this was is no disappointment. It actually looks like it was painted with a brush! 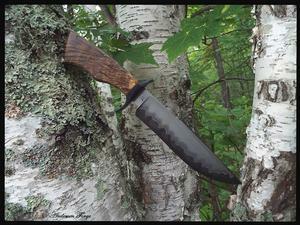 And, the 1095/420 Stainless Steel blade ain't too shabby, either. 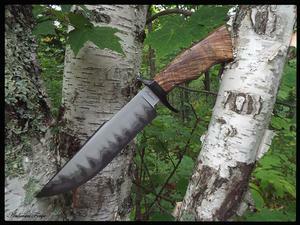 A 416 Stainless Steel guard set up in a Take-Down assembly completes the knife. I hope she gets to see LOTS!!!! of field time. Another stunning example of the beauty of Walnut. 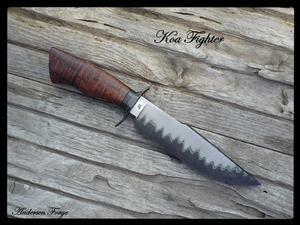 This is a piece given as a gift from knife maker, Don Hanson III from Missouri. 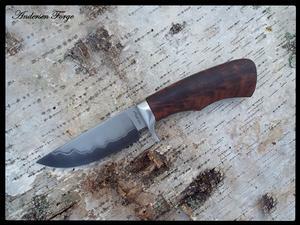 The previous knife up the page is Walnut from Northern California! Both uniquely different locations, yet each very attractive in their own right. 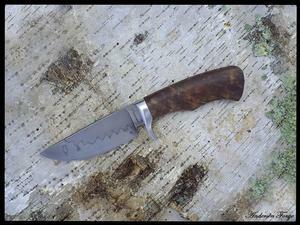 I used W1 Tool Steel for the blade on this one. 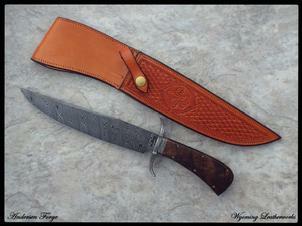 I know this customer personally and also know this knife will dress many, many deer! I hope she sees many years of service. All done in a Take-Down assembly for maintenance. 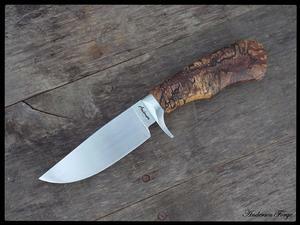 Here is one of the nicest Bowies ever to come off the anvil at Andersen Forge. 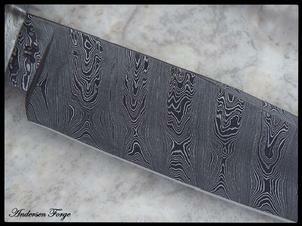 The hot-blued Damascus blade was forged from 216 layers of 1095/15N20 Single Twist. One of my favorite patterns. The fittings are twisted wrought iron, which was made in 1903. 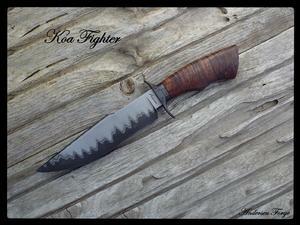 This knife is made in a full take-down assembly that is as strong as any knife I make. And that's no kidding. I often see frame handle knives in the digital world and at knife shows that are built with the idea of the handle scales used to add integrity to the handle frame and actually help hold it together. This handle assembly is full 100% strong without the scales at all. Yet, able to be completely disassembled. That's just the way I roll. The steel frame is hot-blued, as well. 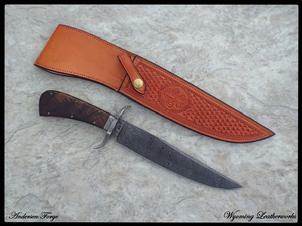 The extraordinary sheath by Scott Teaschner of Wyoming Leatherworks is a site to behold. Scott's mastery of tooling and carving leaves most leather workers in the dust. This whole package could be the center piece of any collector's trophy room.